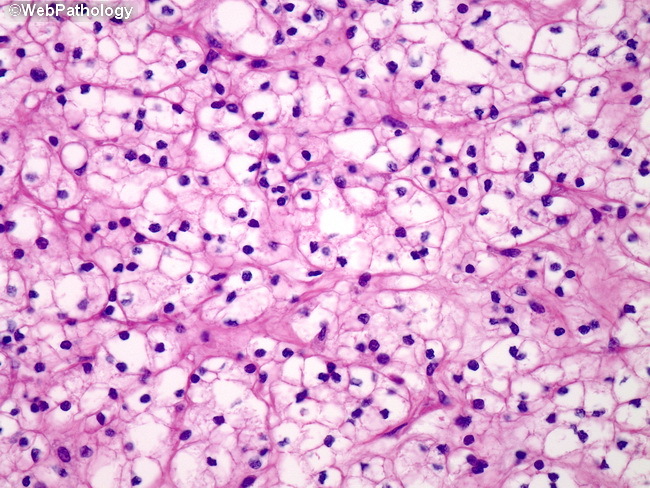 This high power view is an example of a clear cell renal cell carcinoma with Fuhrman grade 1 nuclei. The nuclei are uniformly small without nucleoli. Fuhrman grade 1 nuclei are comparable in size to red blood cells (8-10 microns). Fuhrman grade 2 nuclei are nearly twice the size of grade 1 nuclei. This distinction is important because tumors with grade 2 nuclei have worse prognosis than tumors with grade 1 nuclei.